For Spectralids in Pikmin 2, see Unmarked Spectralid. Yellow Spectralids (黄シジミ?, lit. : "Yellow Clam") are small butterfly-like creatures in Pikmin 3 and Hey! Pikmin. They have yellow wings, very fuzzy, white bodies, purple eyes and two small feet they use to stand on things. They are very aesthetic, as in Pikmin 3 they will fly around any level and land on almost any surface, from flowers to Bulborbs. In this game they also function very much like yellow Unmarked Spectralids from Pikmin 2, in that they leave a drop of nectar when killed. 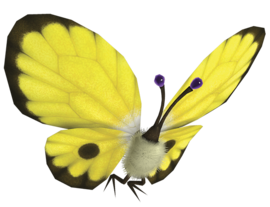 Compared to the other flitterbies in Pikmin 3, Yellow Spectralids have yellow wings with a black "outline", and a black dot exclusive to the bottom wings. In Hey! Pikmin only one appears, but it only shows up in a cutscene, and is not interactable, as it's gone as soon as the cutscene is over. It looks very similar to the ones in Pikmin 3, but it is paler and has spots on the top of its wings. Similarly to the White Spectralid, it doesn't have a log entry for it, so it's technically unconfirmed that it is the same species. However, its behavior and appearance is nearly identical, so it's safe to assume that it's the same. Yellow Spectralids may be seen on the ground, nearby flowers, or the back of a sleeping Bulborb, but in all cases, when a leader or Pikmin approaches them, they will fly away. They will flutter around aimlessly in the air, and while doing so they are difficult to reach. After the leader moves a considerable distance away from the Spectralid, it will return within 10 seconds. In Hey! Pikmin, only one appears, in a cutscene from Back and Forth Road, where it simply flies forward as Pikmin chase it. A direct hit from any type of Pikmin will instantly defeat a Yellow Spectralid. Winged Pikmin are, however, the best option, as they will give chase if the creature tries to fly off. A Yellow Spectralid seen through the KopPad in Pikmin 3. The Yellow Spectralid stuck on the transition zone to the Astringent Clump's room in the Garden of Hope. Screenshot of some Yellow Spectralids on a Red Bulborb, alongside some White Spectralids in the Garden of Hope. The only Yellow Spectralid in Hey! Pikmin, in the cutscene from Back and Forth Road. This page was last edited on January 23, 2019, at 21:17.